Could you survive on $789 per month in San Francisco? On average, that’s what 70% of GLIDE’s Meals program participants must attempt to do. They come to GLIDE to eat because they simply can’t afford to buy, store or prepare their own food. That’s why Rev. 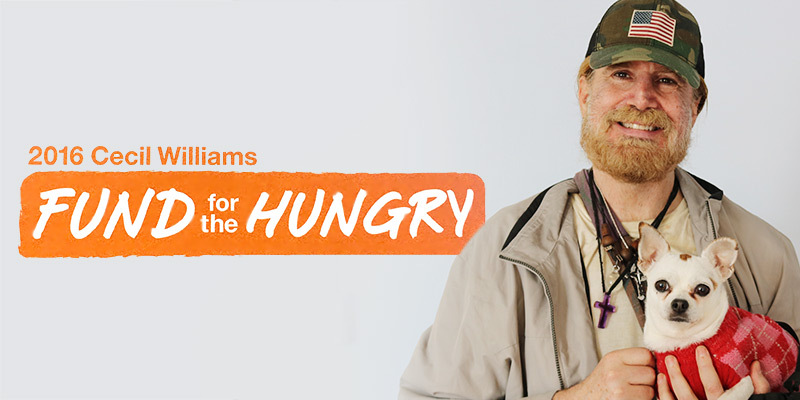 Cecil Williams started GLIDE’s annual Fund for the Hungry campaign many years ago—to raise awareness and funds to feed all those whose incomes don’t stretch far enough and whose circumstances don’t allow for daily essentials. Every day, we serve three free, nutritious meals to San Francisco’s most marginalized residents. This adds up to over 700,000 meals a year, nearly 90,000 of which are prepared for the disabled and families with children, with an additional 110,000 for seniors. The Meals Program is also a gateway to other services. A person comes in for a warm meal and then gets introduced to an array of services that can help them to improve their health, mind and soul through counseling, emergency services, shelter reservations and access to legal services, healthcare and education programs. The cost of one meal is only $4.00, so every dollar you give goes far to feed neighbors in need. This year, your gifts will be stretched even further thanks to a generous fellow donor’s $50,000 matching gift. Every dollar you contribute through June 30 will be matched, so $25 becomes $50. Show love for your community by supporting GLIDE’s annual Fund for the Hungry campaign today!